We have already discussed addition of integers. In this post, I am going to discuss four different techniques in adding integers. In adding integers with the same sign, we just add them and then copy the sign. For example, in adding 2 + 8, 2 and 8 are positive integers, so we just add them, and the answer will be positive. So, 2 + 8 = 10. On the other hand, if both integers are negative we also do the same: add them, then copy the sign. For example, -9 + -3 = -12 since both of them are negative integers. The techniques below are for adding integers with different signs. These strategies are important because you can visualize addition even without memorizing the rules. You can imagine integers as positive and negative chips. Since +1 + -1 = 0, a pair of positive and negative chips will give a sum of 0. So, 3 means 3 positive chips and -4 means 4 negative chips. Since each pair of positive and negative chip cancels out each other (their sum is 0), then the remaining chips after the pairing will be the answer. So, 3 + (-4) as represented below is -1 since only one negative chip remains. Another example is -4 + 6 = 2. =3 + (5 + -5)= 3 + 0 = 3. -11 + 3 = -8 + (-3 + 3) = -8 + 0 = -8. Integers can also be represented as movement on the number line. A positive integer is a movement to the right of 0 and a negative integer is a movement to the left. 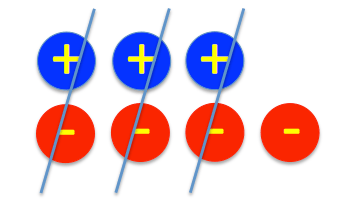 Positive 3 and -2 can be represented as shown below. So, 3 + (-5) can be represented as a movement of 3 units to the right of 0, then a movement of 5 units to the left. As we can see in the next diagarm, it the movement stopped at -2. So, 3 + (-5) = -2. Also, -2 + 3 can be represented as a movement 2 units to the left of 0 and then a movement of 3 units to the right. The movement stopped at 1, so -2 + 3 = 1. (3): finally, add the two sums: 13 + (-3) = 10. Try using the techniques above by answering the following and share to us which technique do you like most.